The Gilbane team completed benchmark rooms ahead of schedule as well as a mock-up for the exterior skin of the new building for quality control purposes. 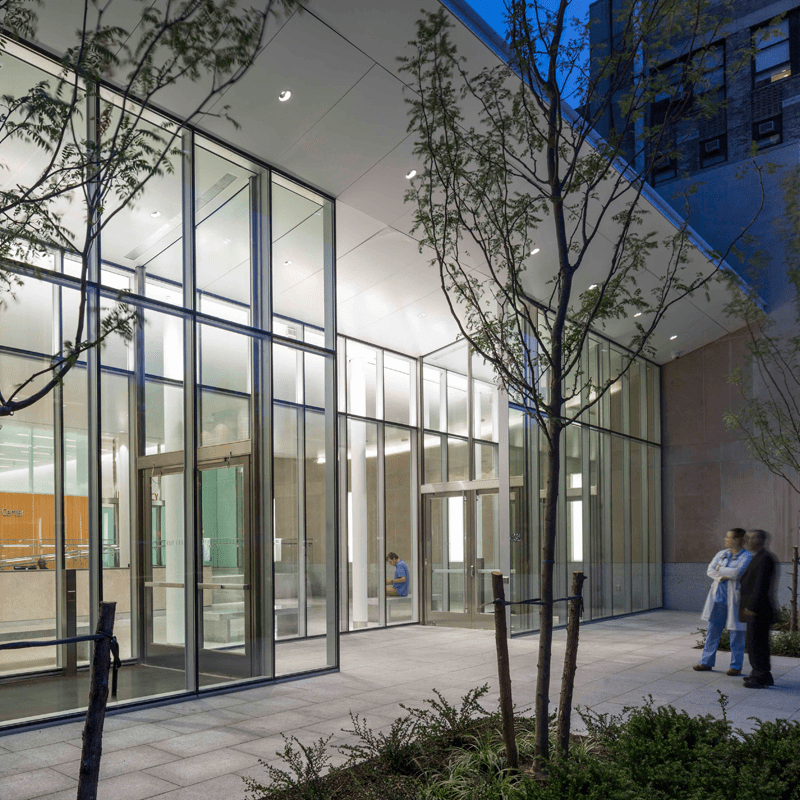 Gilbane provided construction management services for the renovation and expansion of the 73,000 SF existing Adult Emergency Department located on the ground floor of the Vanderbilt clinic. The new Adult Emergency Department is double the original size of the space, with dedicated treatment and specialist spaces, allowing the hospital to treat more patients and provide them with better care through a more efficient space. As part of this project, the Energy Court was converted to a dedicated waiting room for the Adult Emergency Department (AED) and a new Rapid Medical Evaluation (RME) area consisting of five new triage bays and 26 new exam/treatment bays. The refurbishment and expansion also included a new waiting room, entrance, trauma and ambulance corridor, acute care space, staff support, and dedicated radiology and psychology areas. 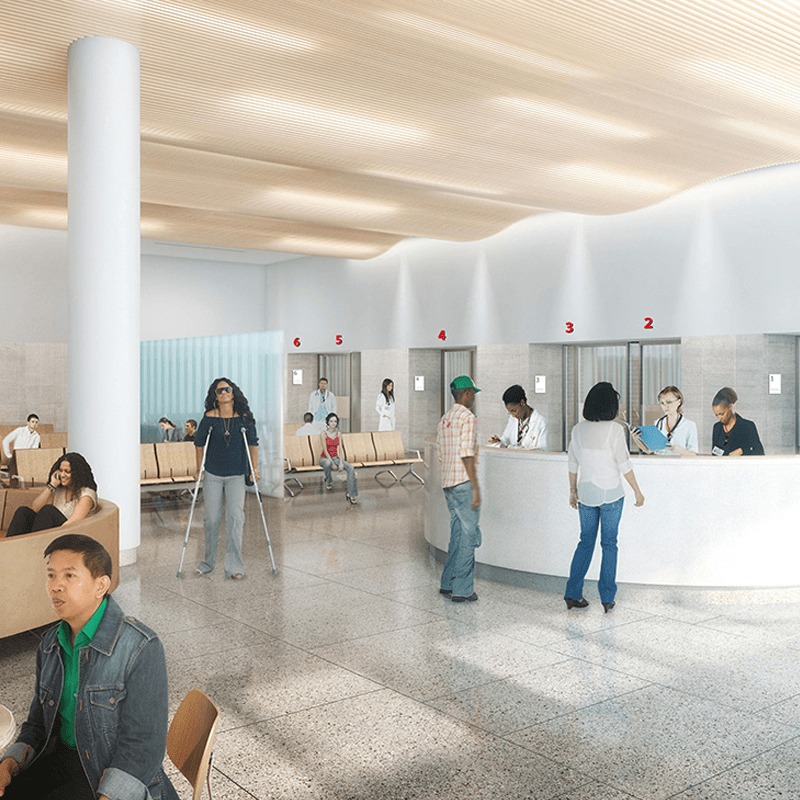 These are in addition to the existing 45 treatment spaces in emergency department patient care areas A, B, C and D.
Phase 1 – Construction of a temporary emergency department waiting and registration area as well as a triage space to enable the emergency department to continue full operation during construction of the new entrance, waiting room, triage, and RME. 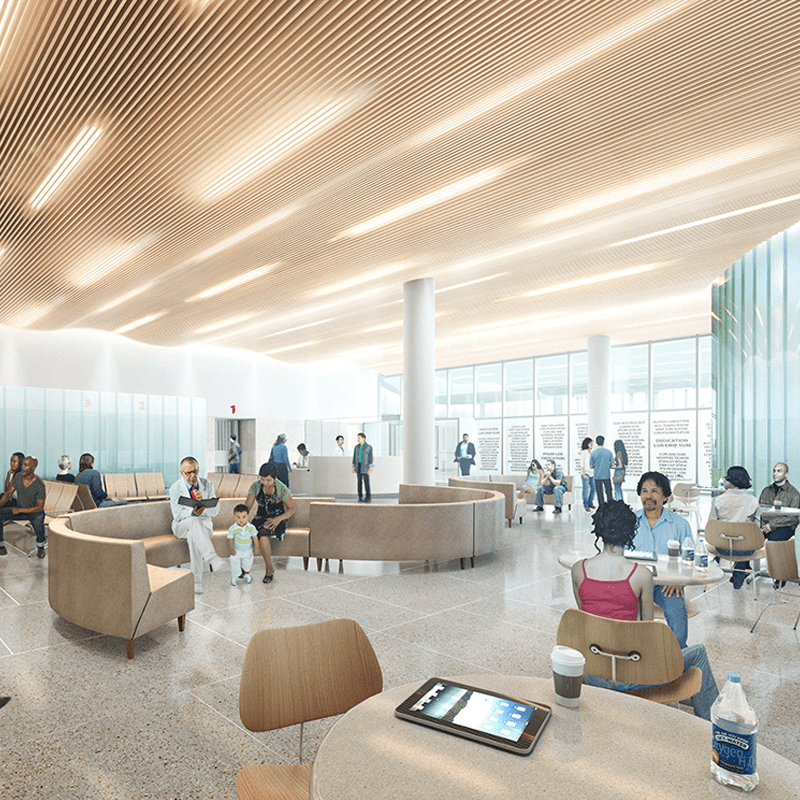 Phase 2 – Full gut renovation of the existing administrative office suites on the first floor and MEP fit-out to make room for the construction of new emergency department observation rooms. This phase also included 15 fully enclosed single-occupancy patient rooms, supporting charting stations, medication area, crash cart alcove, nutrition station, bathrooms and showers. Phase 3 – Demolition of the main entrance 5-story atrium to build a new dedicated ambulatory entrance and waiting area for the Adult Emergency Department and public hospital entrance. The construction of the enclosed MER penthouse with all new MEP infrastructure for future phases was completed as well as all exterior work along Broadway including landscaping, façade work, and sidewalk refinishing. Phase 4 – Construction of a new trauma room with acute care tow beds immediately adjacent to the ambulance bay. This phase also included 13 new treatment bays and charting stations along with minor re-routing of the corridor to accommodate the new trauma room and the relocation of an existing shower room. 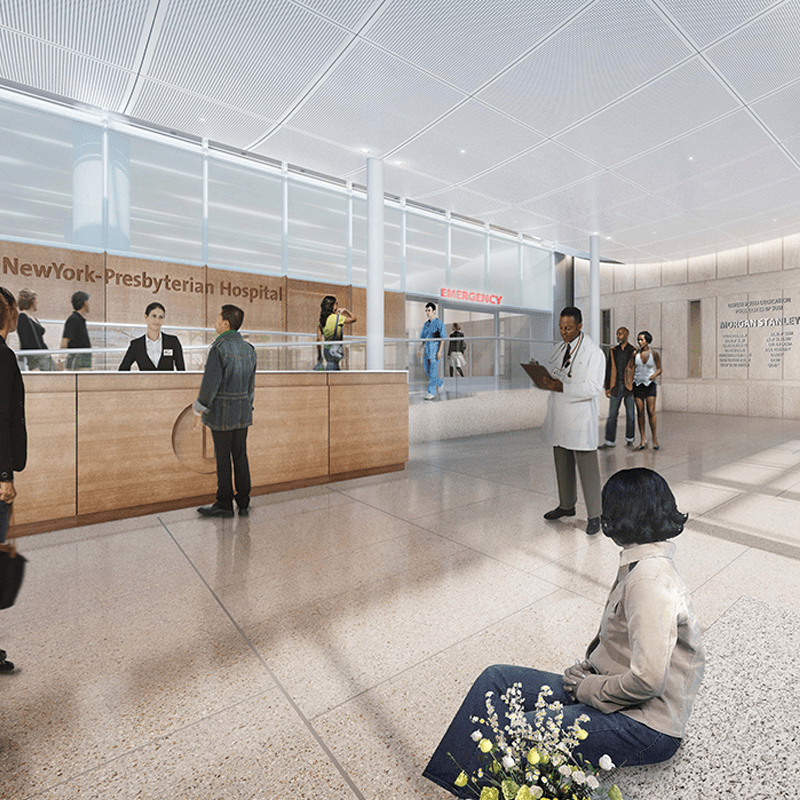 Phase 5 – Renovation of existing Area B to create new code compliant treatment and support spaces, including 14 treatment bays and acute care treatment rooms. In addition, the temporary waiting and registration facilities adjacent to Area D were transformed into the permanent staff lounge and locker room. Respecting the fully operational hospital throughout all stages of the project was critical to its success. While the new space was created to improve patient care, it was vital to maintain a high standard of hygiene and minimize disruption throughout the construction period. Consistent communication, critical programming and dedication to dust containment were all vital factors in ensuring a smooth project journey that allowed for the continuity of patient care. Architects are daSILVA Architects, Davis Brody Bond and AKF Group. Gilbane provided full preconstruction services. We engaged multiple key trades to help identify existing conditions. For example, above ceiling probes and surveys were performed to help identify existing mechanical and plumbing systems. An electrical contractor was hired to verify hundreds of electrical circuits due to a lock of as-built drawings. Gilbane coordinated multiple estimates and value engineering sessions to help the client meet their budget. Gilbane proposed 70 value engineering options totally $4.4 million dollars and the client accepted $1.8 million.